Nothing sparks up gatherings like a live fire. 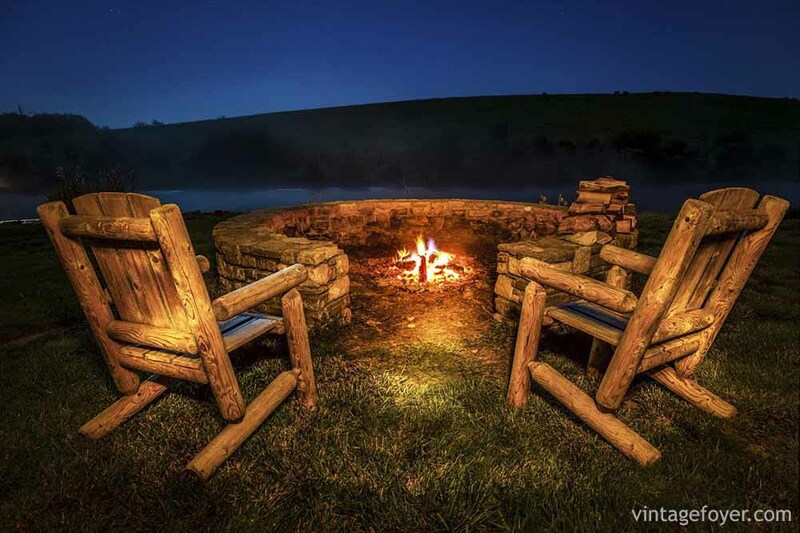 People are naturally drawn to the warm atmosphere that only a burning flame can bring, at an intimate dinner or a full on bonfire party. 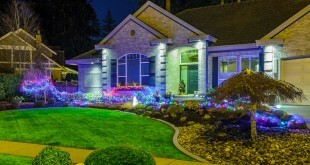 If you’re looking for creative ideas to heat up your outdoor area without breaking the bank (well some of them may actually be costly but they are worth it), then this post is for you. 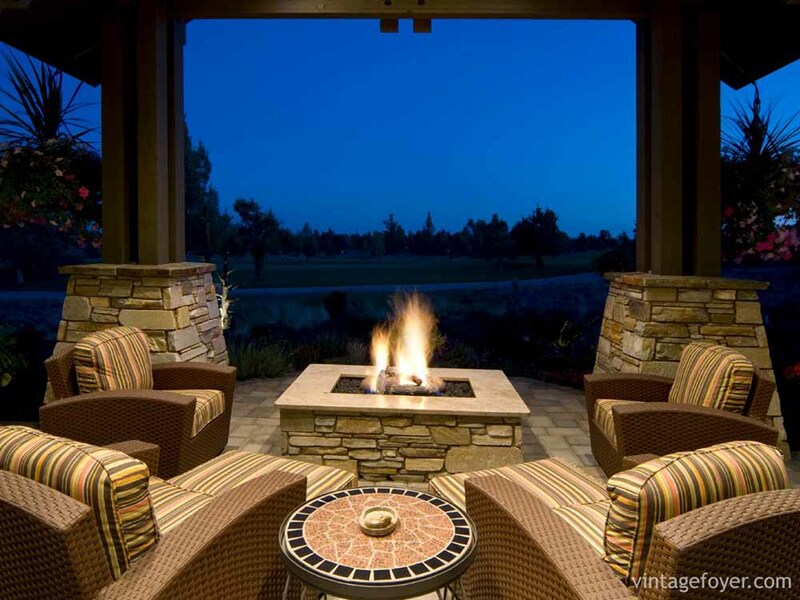 In this collection of exterior design ideas, the versatile fire pit takes center stage in a variety of shapes, sizes and style. 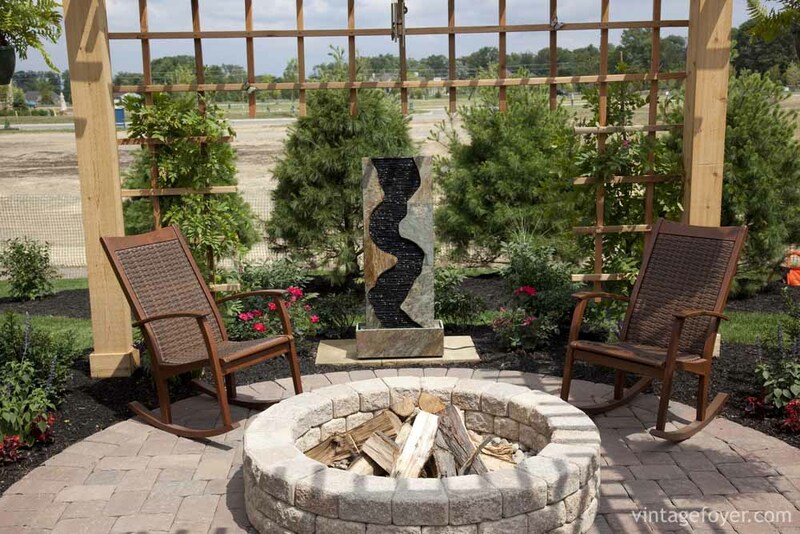 A fire pit, whether permanent or mobile, can serve as a functional focal point for your outdoor decoration. Selections range from the convenient gas burners and the more traditional wood burning versions. 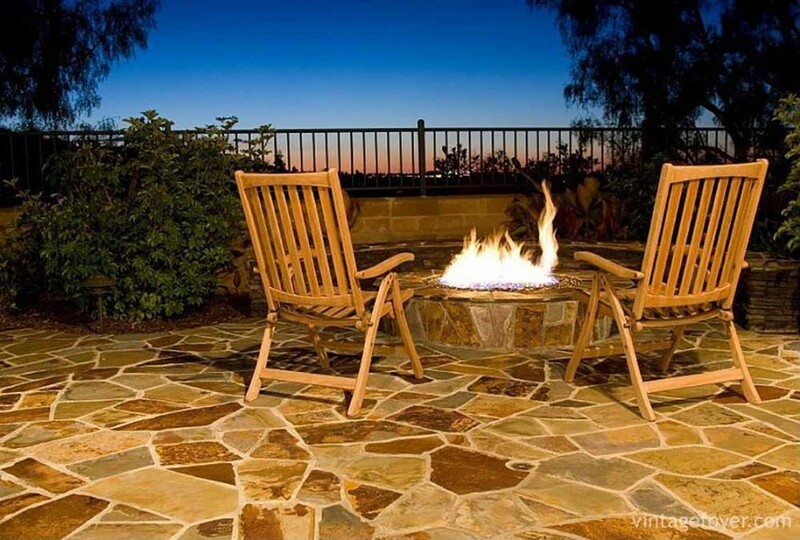 Scorch up your backyard, poolside patio, garden or balcony with these cool ways for decorating fire pits. 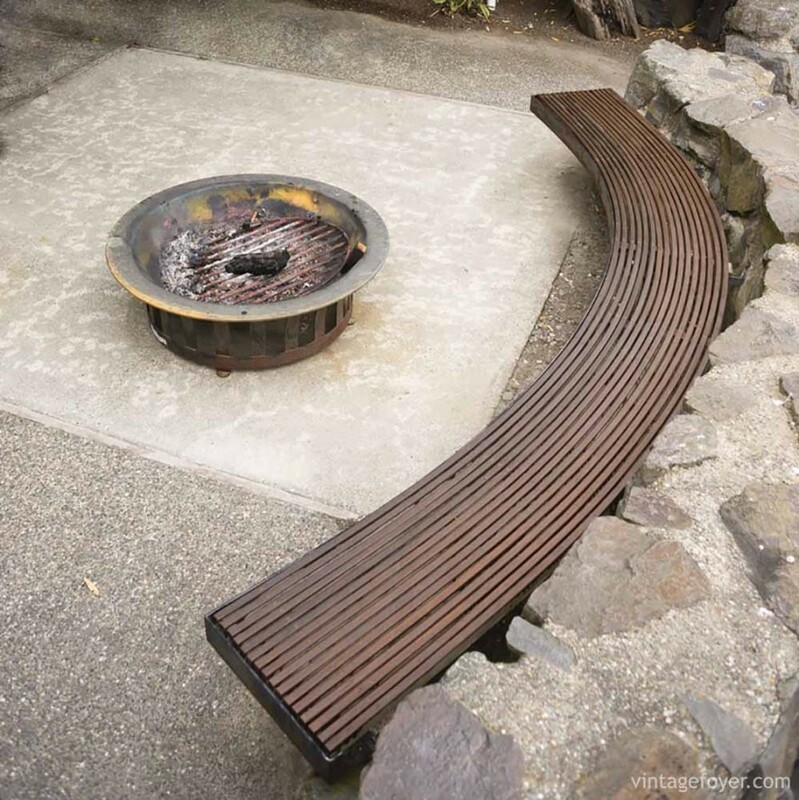 Simple and slim, this metal fire bowl is a perfect fit for small patios. The patina finish makes wood furniture an effortless match for this little burner. 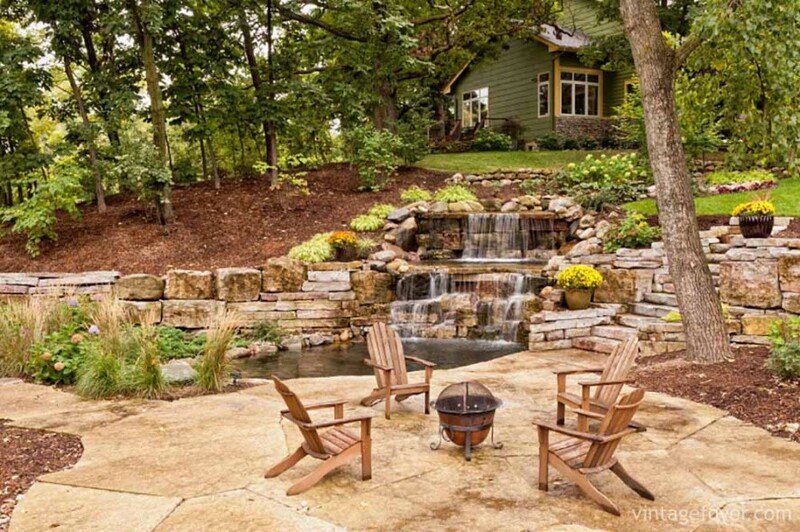 A portable fire pit with a dainty scroll base completes the elements in this flagstone patio with a stunning two-tier waterfall. 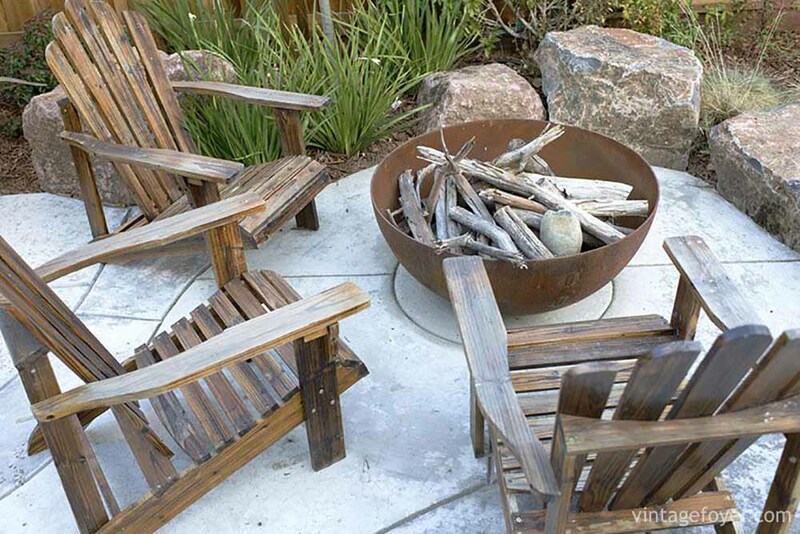 Blaze up your backyard with a trusty gas fire bowl. The calming tones of timber, wicker and stone grace this airy living area situated just a few steps from the woods. A combination of limestone tiles and medium-sized rocks adorn this custom garden patio with a retaining wall. The built-in pit serves as an ideal centerpiece for the open space. 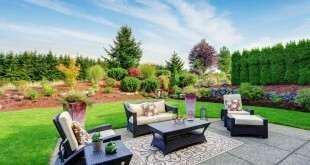 Here’s a breezy open yard with cut stone paves and elevated planters. Add some sultry red around a portable pit for a touch of contrast against the serene green. 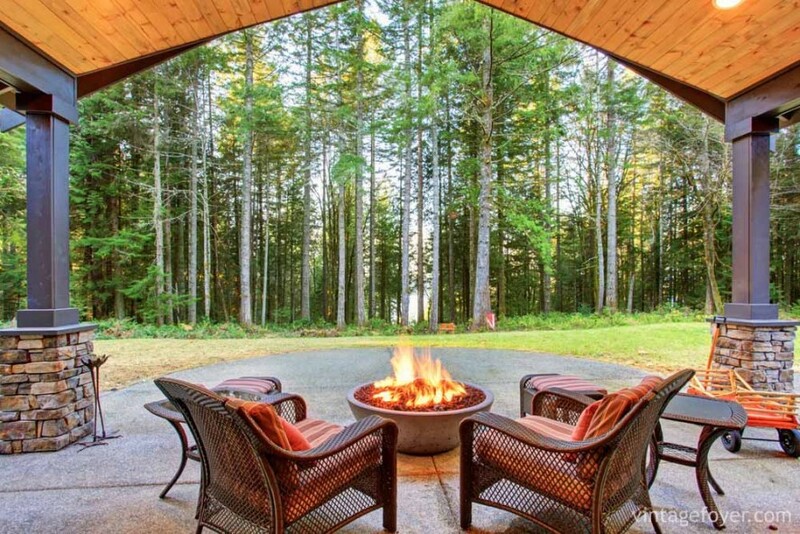 Gather ‘round the fire in this sublime backyard with endless space. Nature rules the design of the sunken rock pit complemented by natural wood benches and stone slab seating. Sleek rock and concrete patio with a customized dark wood bench simulating the curve of the custom-built stone deck.  The contemporary look of the versatile metal pit is also reflected in the lines of the bench. This stacked open-ended pit is a smoking hot centerpiece for this waterfront yard. The practical design is decked with simple wood chairs bringing the countryside feel to a full circle. 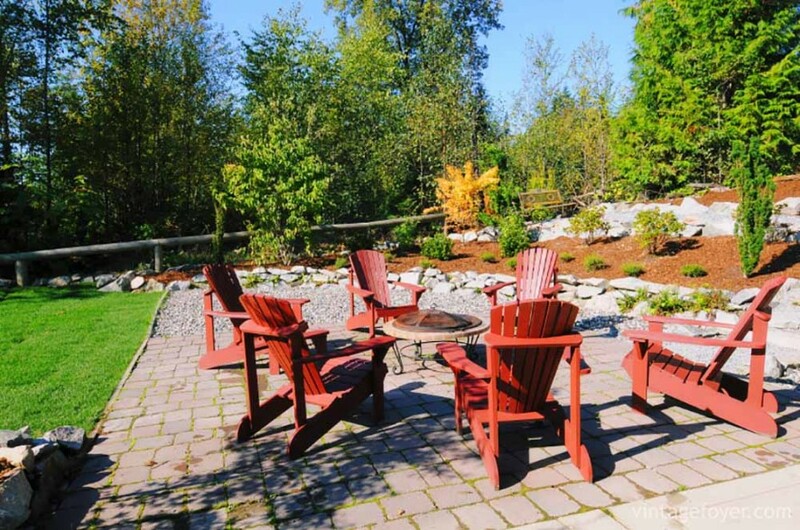 Here’s another outdoor deck with classic brick pavers surrounded with picturesque landscape. 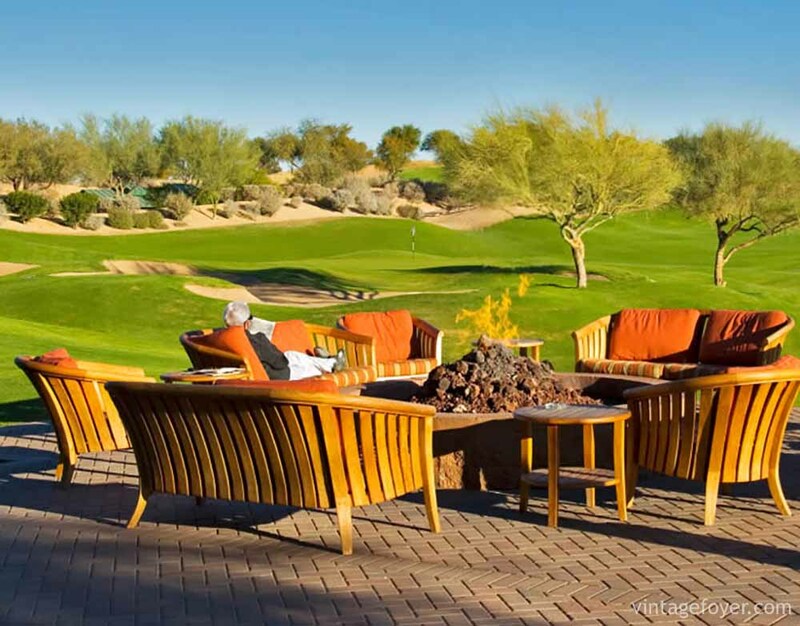 The custom concrete fire pit is encircled with elegant wood furniture, upholstered in shades of orange. Traditional teak furniture and a semi-circle deck sitting area round up this polished stone deck with an inbuilt pit. Fiery views of the sunset add in for a super luxurious outdoor space. 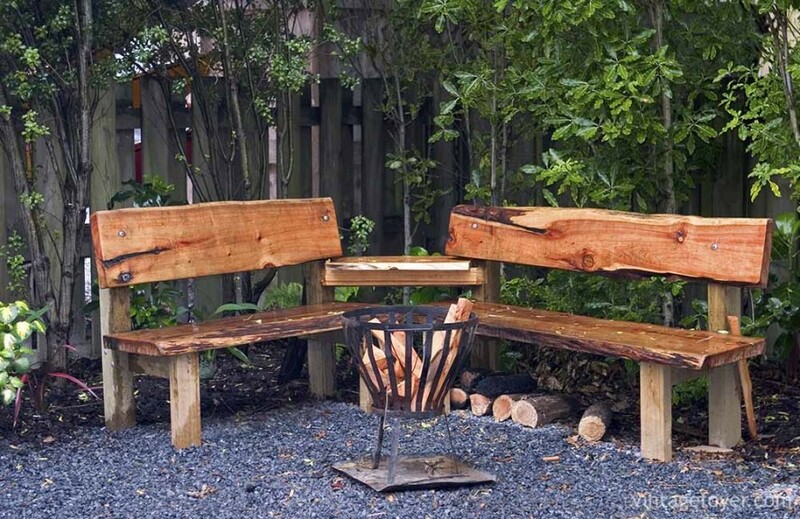 These custom-built wood benches linked by a clever little tabletop lend their functional beauty to this cozy outdoor space with a simple dark metal pit. 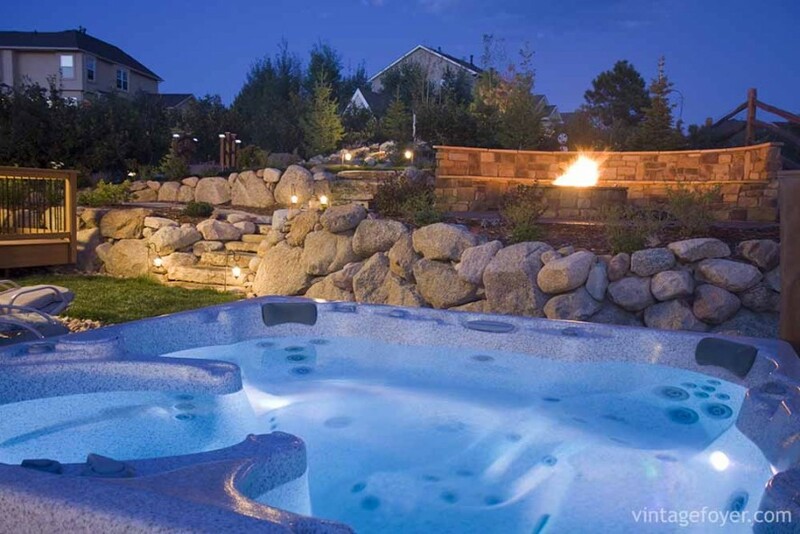 Absolutely no cold nights allowed in this lavish yard outfitted with a hot tub and an elevated sitting area. Stone slab steps lead to the pit, perfect for warming up after a quick dip and the occasional marshmallow party. 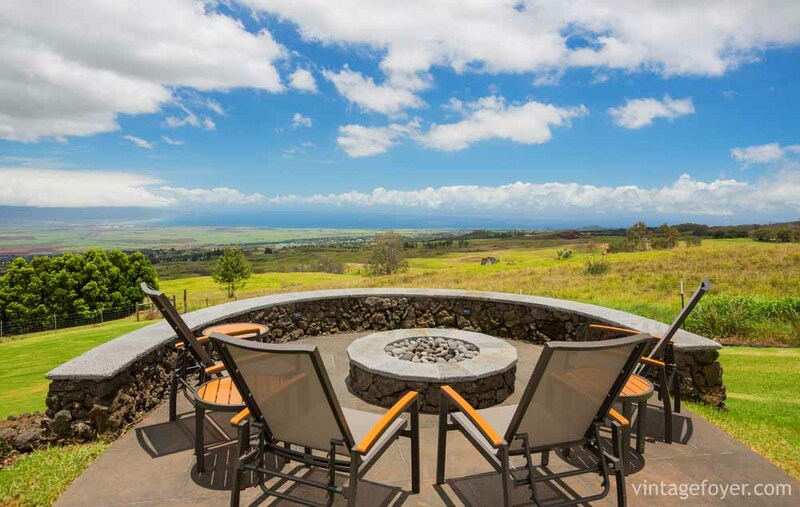 This raised fire pit provides sophisticated comfort for entertaining guests after a hearty meal at the adjacent dining area. 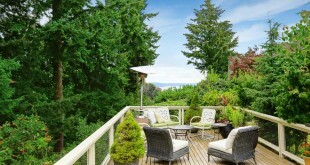 The patio is set in limestone and furnished with a mix of metal and wood furniture, a flat screen TV and a grill. 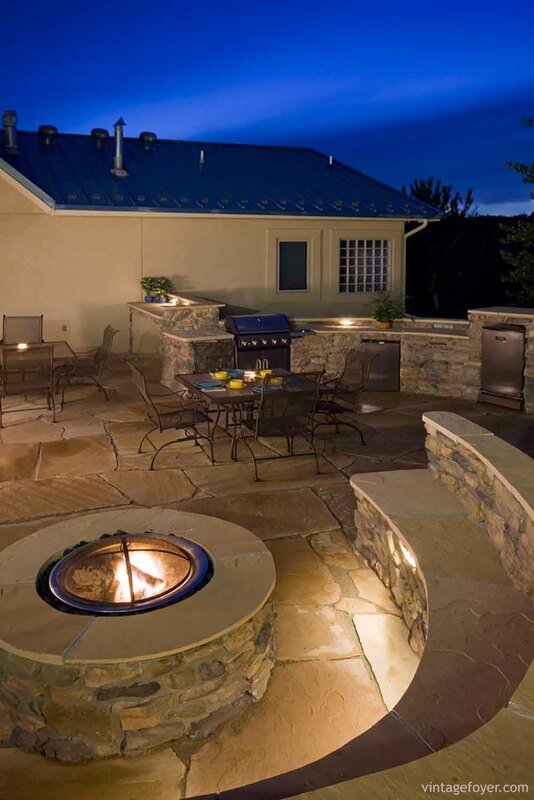 Here’s another living space in luxurious limestone, custom-fit with a square fire pit. 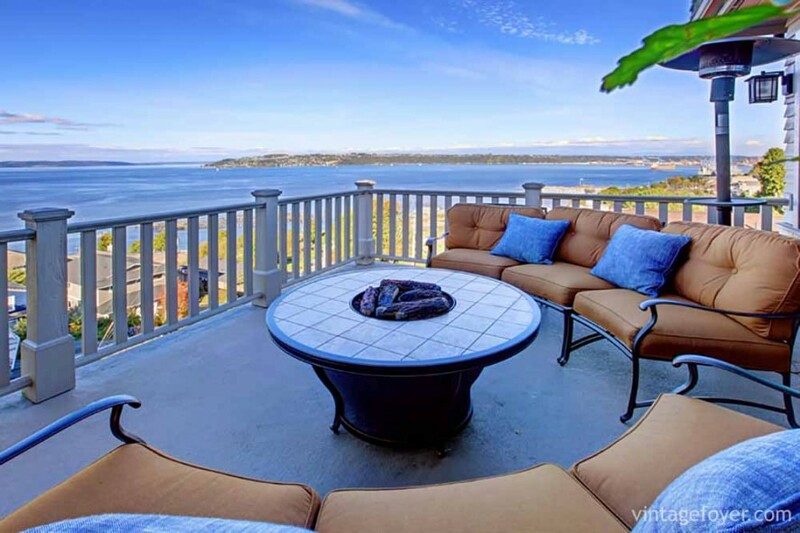 A mosaic-tile round table stands out amid the clean lines of the furnishings in this roofed deck with a lovely view. 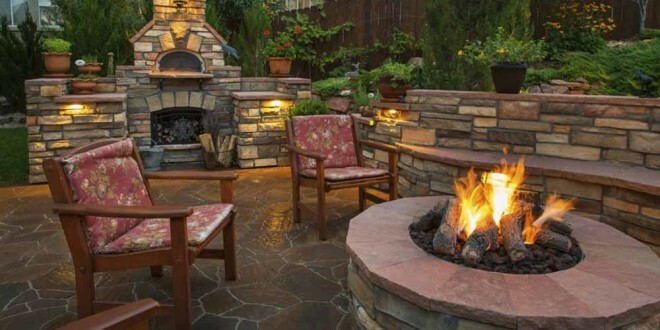 Two flames are better than one in this gorgeous backyard decked with a full-scale fireplace, a dainty garden, and stones in a variety of shapes and finishes. 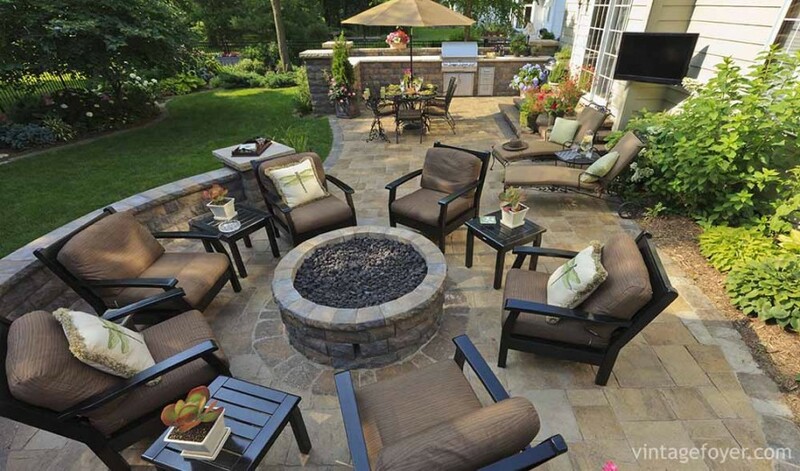 There’s plenty of room around the raised fire pit furnished with charming chairs. Relax in a cool-hued outdoor space furnished with rock benches. 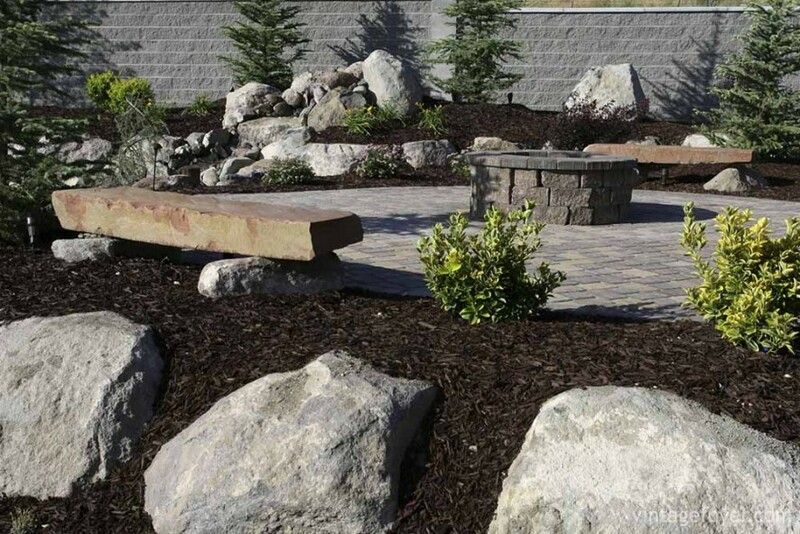 The choice garden arrangement flawlessly highlights the natural beauty of the stone pit. Scenic seaside balcony centered on a sleek tabletop pit. The rich brown upholstery grounds the space, while the cool blue mirroring the sky makes the throw pillows pop. 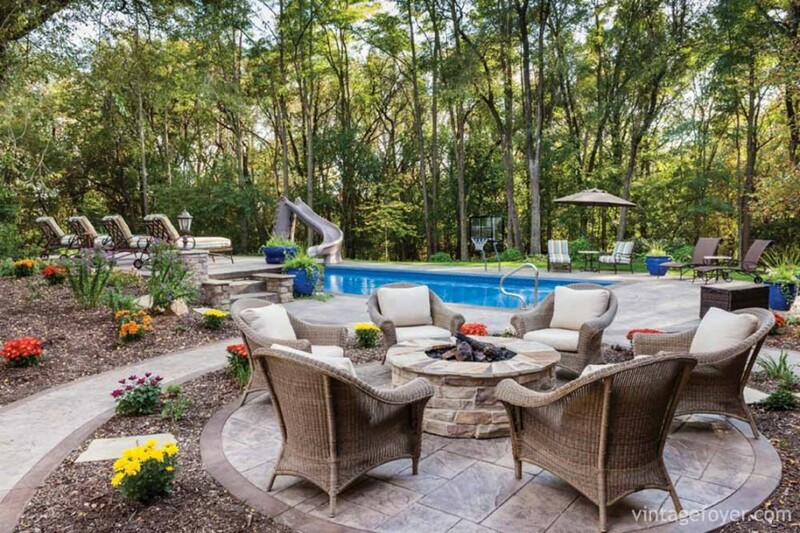 Live the high life in this massive poolside open patio with a raised fire pit made of stone. The beautiful neutral tones in the mixed material furniture pieces complement the water and the green woods. 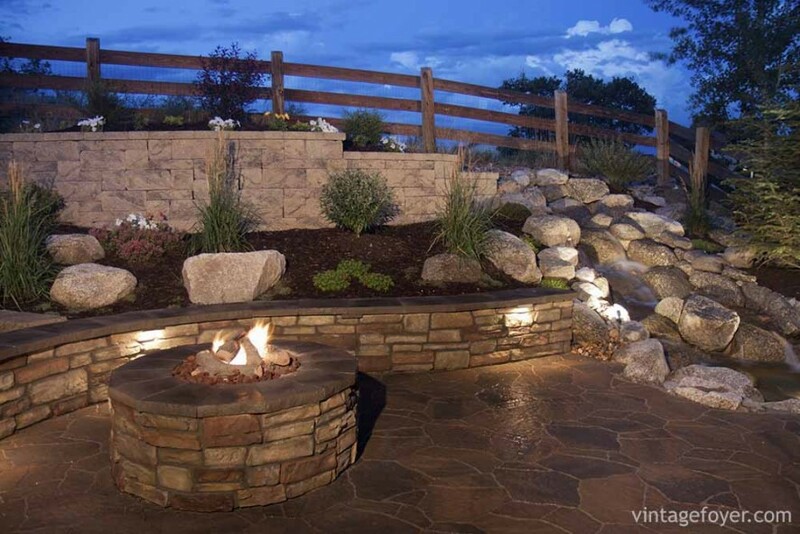 This garden fire pit is bordered with natural rocks to contrast with the flat stone flooring. A pretty pair of wooden lounge chairs completes the look of this wide and wonderful living area. Here’s a red stone pit in a contrasting round shape against the square stone tiles. The space is maximized by a fine assembly of polished teak chairs and side tables. 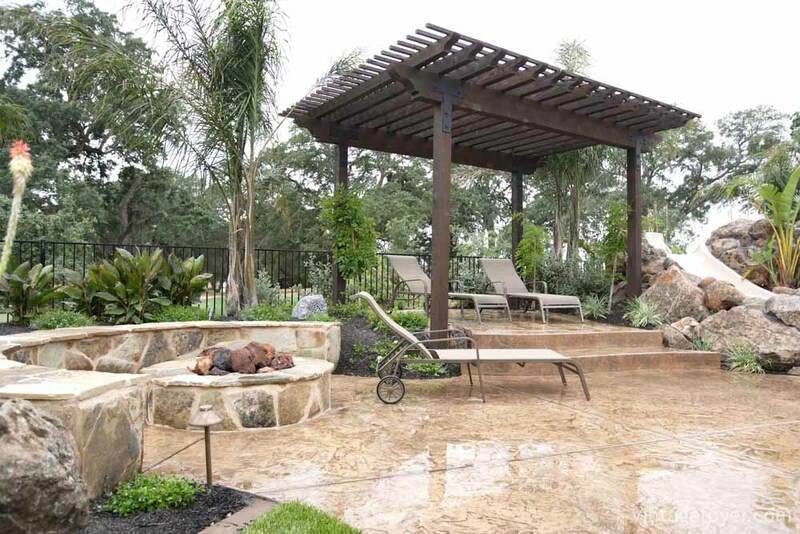 An expansive garden patio with stamped concrete flooring, a regal dark wood pergola and a perfectly sized fire round pit partnered with half-circle stone seating. Lean lounge chairs complete the relaxed appeal. This romantic pool-lounge backyard has white-hot floors and a unique D-shaped raised pit with limestone tiling. The play on geometry and minimalistic gardening makes for a clean and upscale atmosphere. 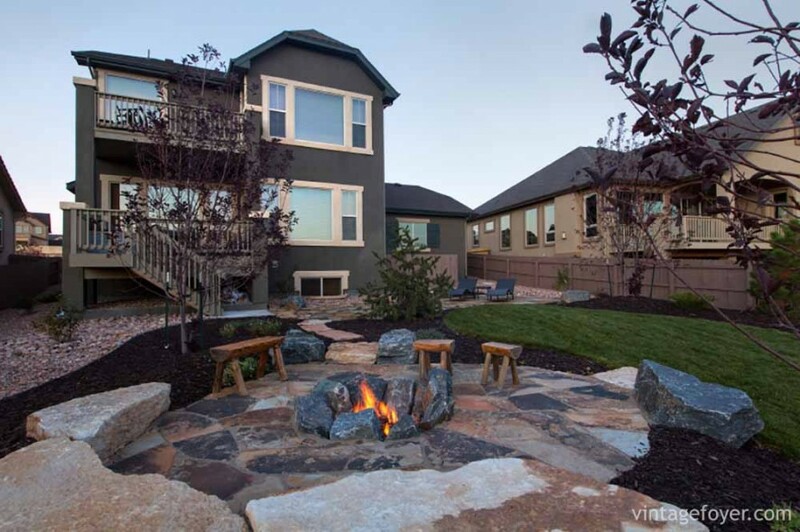 This modern oasis surrounded by breathtaking mountain peaks features a permanent circle fire pit which reflects the same gray tones of the extensive brick flooring. 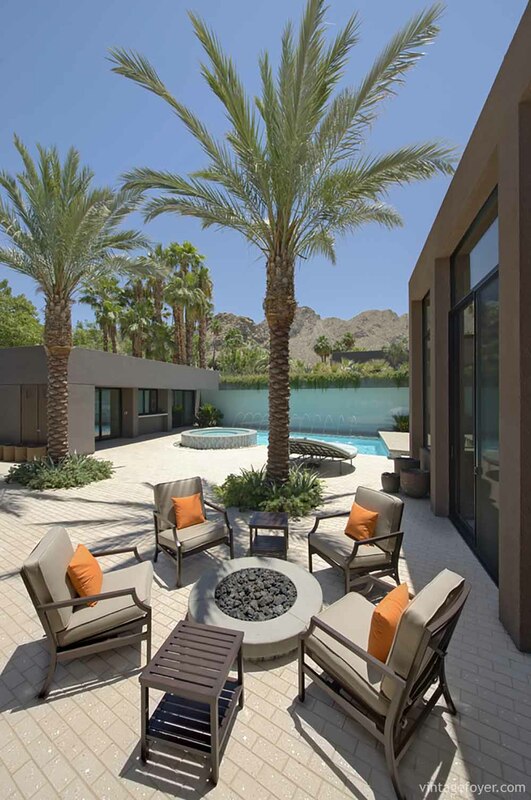 A custom-built pool, edgy furniture and towering palms complete the sharp, sophisticated look. 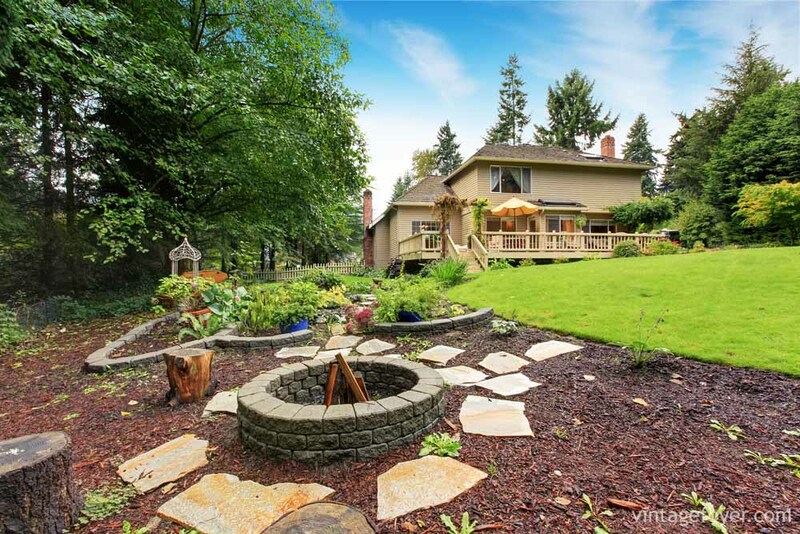 Here’s an elevated patio stacked in stone, in the middle of lush green meadows. 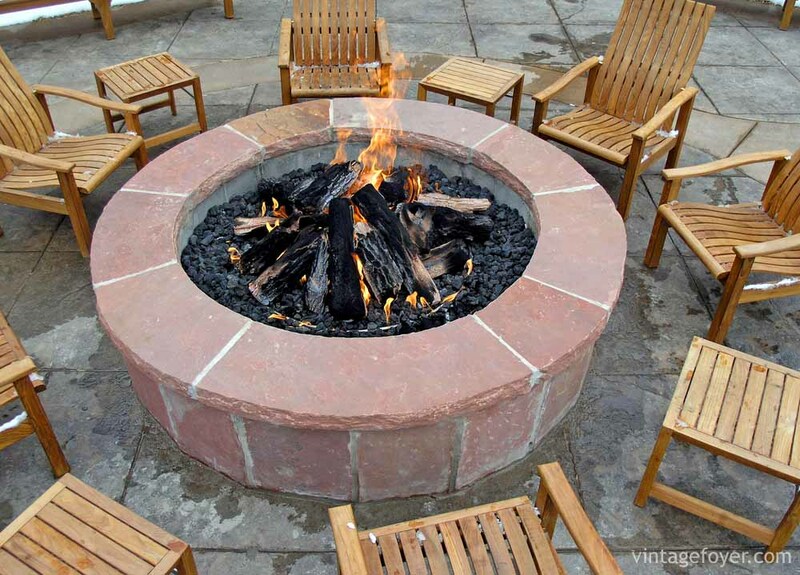 The raised round fire pit is permanently built with a curved bench, supplemented with sleek waterproof furniture for a more updated design. 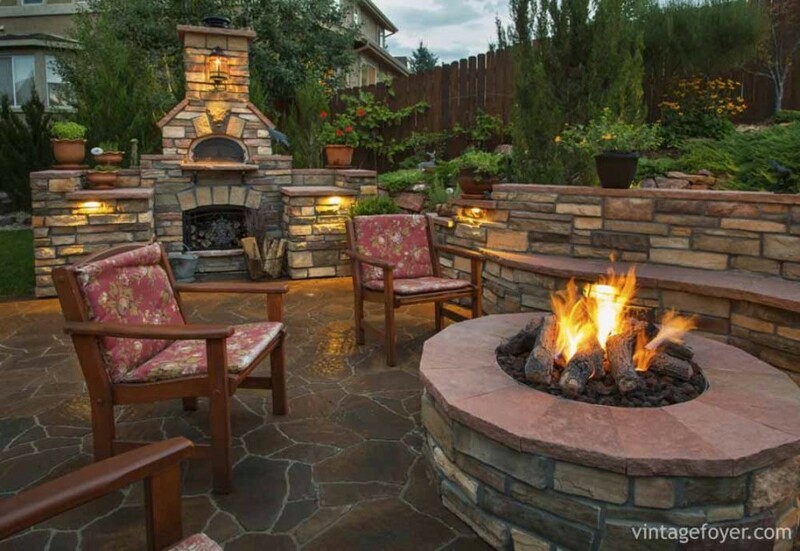 A mobile tabletop pit completes the rustic ambience of this open patio. 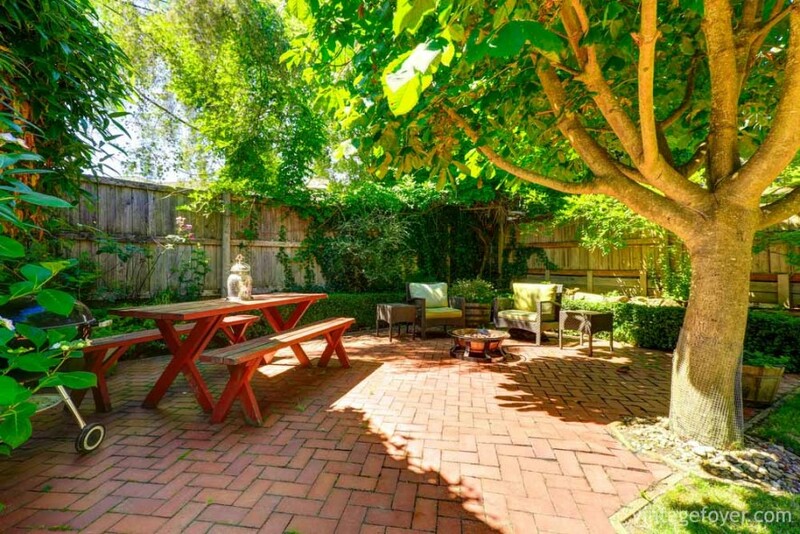 The red brick flooring and simple park bench dining furniture look striking with the sitting area’s cool greens reflective of the surrounding foliage. Cut stones form this pit shaped like a well, built on a garden inspired by castle ruins. The irregular shapes of the stone steps add to the old world feel of this open design. 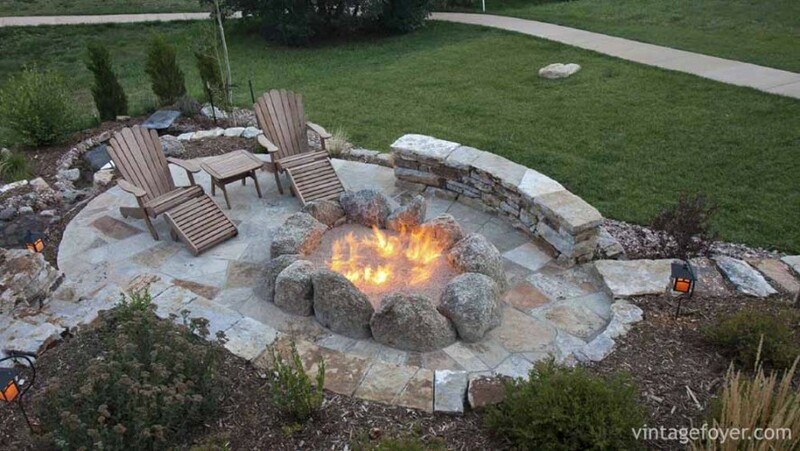 Here’s a covered fire pit built in the same natural stone as the entire space. The circle-shaped patio looks grand with its walled sides, dining and sitting areas both furnished in traditional metal furniture. 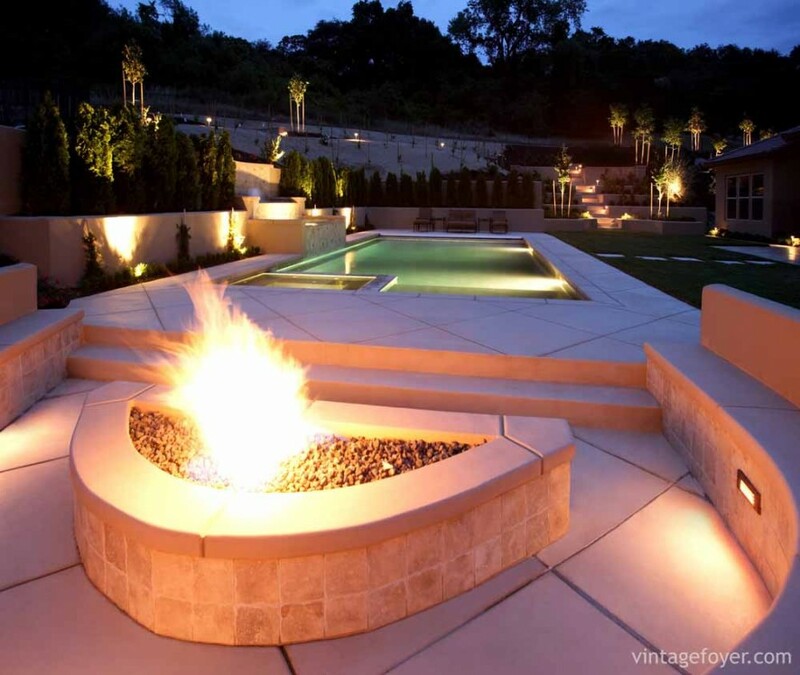 A contemporary fountain complements the wood-burning permanent pit atop pavement in the same round shape. The traditional appeal of the bricks beautifully contrasts with the lines of the minimalistic trellis in this modern garden. 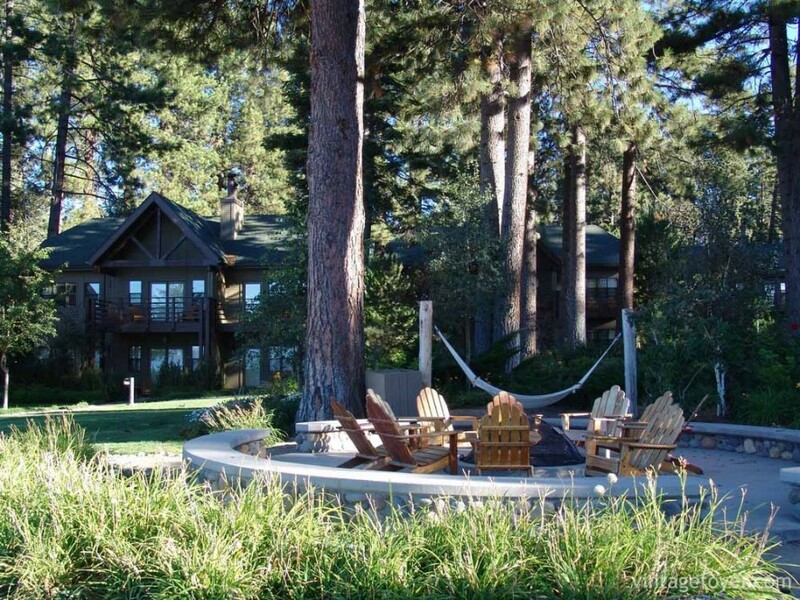 This outdoor campfire is representative of lakeside resort life. Simple wood furniture and a trusty hammock finish up the relaxing spot nestled by tall pines. 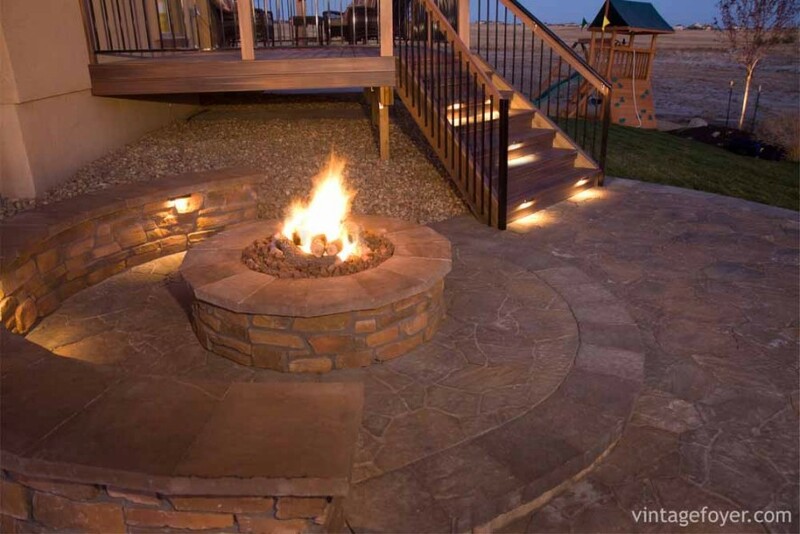 Here’s a straightforward fire pit built in natural stone. Keeping the same warm tones for the pit, permanent seating, flat cut stone floors, and the balcony wood makes for a cohesive look.